While I like to knit things in all different weights of yarn there is something so nice about sock yarn. Although it’s a triffle thin for some (28 stitches per 4 inches) it’s still thicker than lace, which means it goes a little faster. What I really like about sock yarn is that it so very versatile. I recently finished a couple of lovely socky projects. The first is my charming little Ishbel by Isolde Teague made with 1 skein of the lovely Fleece Artist Casbah sock yarn. 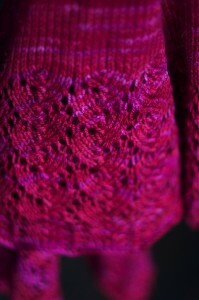 One skein of Casbah is 380 yards which is enough to make a pair of socks or a small shawl. It has a hint of Cashmere in it which makes it super soft and lovely to work with. 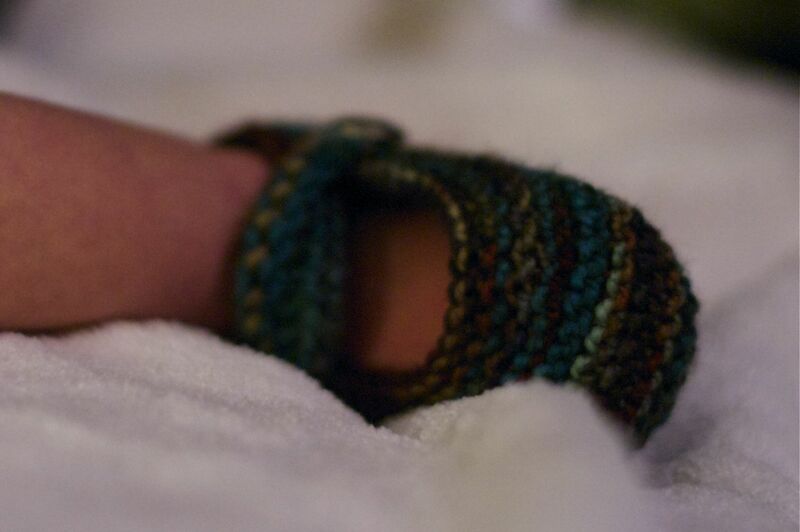 The second project is a wee one, some little shoes. These ones are Saartje’s Baby Booties, a popular free Ravelry pattern. They knit up in no time and look super cute! They are also an excellent reason to use adorable buttons. Each bootie gets 2 little buttons to fasten the straps. Unfortunately Nat’s little feet were on the move for this picture! 1. 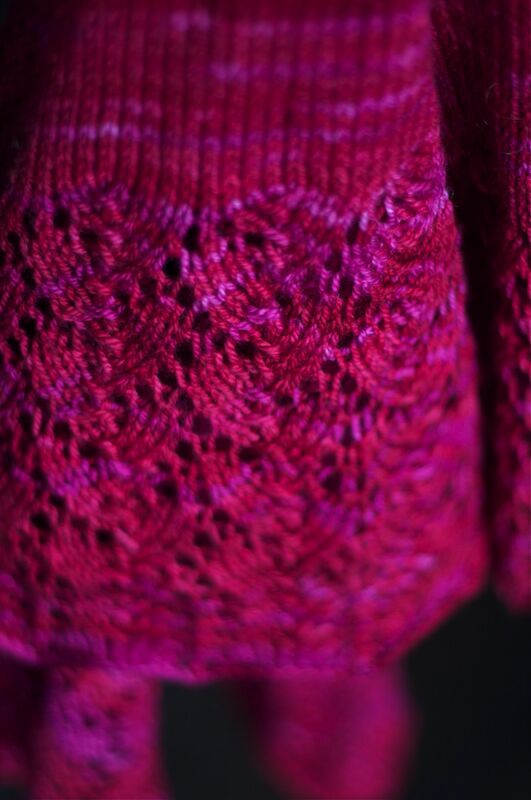 You can add so much detail to all things Fair Isle because you have more stitches to work with, which is great. 2. 1 skein makes a whole project. I love it when this happens but it does make sock yarn dangerously easy to stash….The other benefit to the one skein project is low colour comittment. When considering yarn for a sweater you have to think about what colours the person who will wear the sweater likes, the pattern involoved, etc. With a one skein sock yarn project you can really just go nuts. 3. If you hold a sock yarn doubled you get a 20 stitch gauge, which is pretty close to a DK weight, and also good for lots of things. 4. 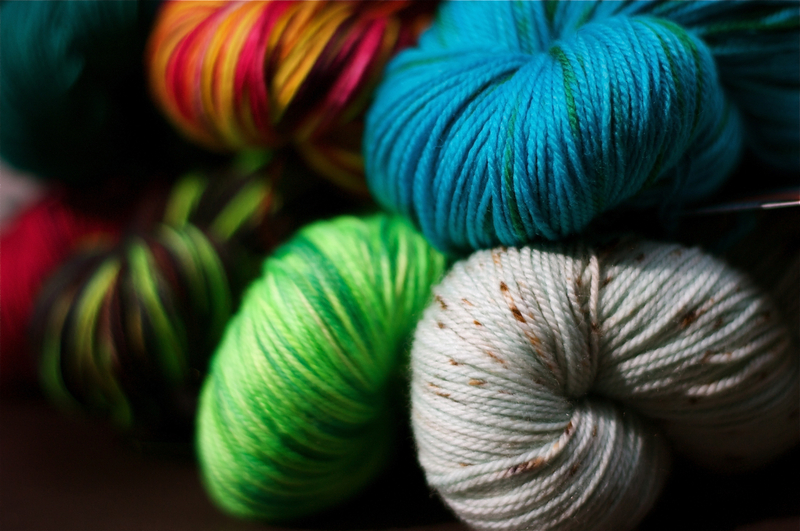 Sock yarn comes in all kinds of crazy colour combinations but also some lovely subtle hand dyes. There are a lot of small Independant Dyers that do some really funky things with sock yarn, more so than other weights. 5. Socks are a lot of fun, give ‘em a try if you haven’t already! This entry was posted on Thursday, July 8th, 2010 at 9:01 pm	and is filed under Uncategorized. You can follow any responses to this entry through the RSS 2.0 feed. Both comments and pings are currently closed.